OnePlus 3T vs Samsung Galaxy S7 Edge Release Date, specifications ,features ,camera ,fingerprint sensors, build design, display quality and know the detail of battery, storage ,compare size and price full comparison review in the USA ,UK and India,which is better and value for money should you buy S7 Edge or OnePlus 3T. 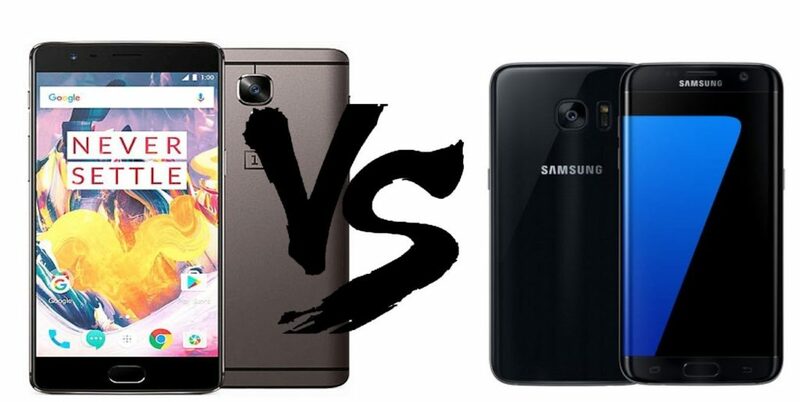 OnePlus 3T vs Galaxy S7 Edge Full phone comparison how both devices different from each others,which is best for buy in budget Samsung galaxy S7 T-mobile ,Sprint ,Verizon Wireless, AT&T,Amazon Specs and price comparison. Colors Gunmetal and Soft Gold Black Onyx, White, Gold, Silver, Pink Gold ,Blue Coral. Display 5.5-inch (1920×1080 pixels) Full HD Optic AMOLED display with 2.5D curved Corning Gorilla Glass 4 protection,401ppi. 5.5-inch Quad HD (2560×1440 pixels) 534 PPI Super AMOLED always-on curved edge display, Corning Gorilla Glass 4 protection. Camera Primary 16-megapixel rear camera with LED flash, Sony IMX298 sensor, 1.12 micron pixel size, f/2.0 aperture, EIS 2.0, PDAF, OIS, 4K video recording . 12MP rear camera with LED Flash, f/1.7 aperture, Smart OIS , 1/2.5″ sensor size, 1.4 µm pixel size,4K video recording. Processor 64-bit 2.35GHz Snapdragon 821 Quad-Core Kryo. 64-bit Octa-Core Exynos 8 Octa 8890 (2.3GHz Quad + 1.6GHz Quad), Qualcomm Snapdragon 820 Quad-core at 2.15GHz. Connectivity 4G LTE with VoLTE, WiFi 802.11ac dual-band (MIMO), Bluetooth 4.2, GPS + GLONASS, NFC, USB Type-C and Hotspot. 4G VoLTE, WiFi 802.11 ac (2.4GHz and 5GHz), Bluetooth 4.2, GPS and Hotspot.